It's my house too. The only real difference is that, although I don't wash the non-needed dishes at all on shabbat, I do stack them nicely and scrape/rinse anything that would smell bad. I make sure the dishwashers are empty before the beginning of Shabbat (or at least finished and opened), and stack the dirty dishes in the dishwashers as I clear the table from each meal. Then, once the dishes overflow past what will fit in the dishwasher, I stack them as neatly as possible on the counter (not in the sink!) with dirty silverware in the dirty soup pot, so that the lid can hide it. I am careful to rinse (quickly in cold water) the chicken soup dishes, as rotten chicken soup makes me gag. This leaves the sinks free, so that anyone can come and wash for the next meal without having to have the water fall on a pile of dirty dishes. Believe me, a neatly stacked pile of 30 plates is not *nearly* as depressing as 8 plates that have not been scraped at all, with the silverware sticking out on all sides, with little fruit flies swarming around them on Sunday morning. Motzei Shabbat, I have no energy to clean the cholent pot. My guilt-reducing way of respecting" my cholent-pot avoidance is to pour some nice hot water into the dirty cholent pot. This gives it a day to soak, making the task somewhat easier on Sunday when I do finally get to it. I also put some hot water with soap in the soup pot that holds the dirty silverware. As soon as Havdallah happens, the first things that I do require no energy: put soap in the dishwashers and start the first loads, turn off the blech, urn and crockpot(s), pour the hot water into the cholent pot and soup pot, and check the answering machine for messages. Then I leave the kitchen. One other thing that makes me feel in control of the motzei-Shabbat house is to change the tablecloth as soon as possible. Our dining table is visible from the front door. Changing to a fresh tablecloth makes the entire dining room seem "done" and fresh. At this point, although very little physical work has been done, the house isn't nearly as depressing. The dishes may not be clean, but they are stacked and look ready to clean, with no fruit flies or congealing food. The dining room isn't vacuumed and there are likely to be a few very sticky chairs, but it *looks* ready for another meal. In the kitchen, the food is put away so it won't spoil, and the devices are turned off. We can still *use* the kitchen, even though there's a lot of work left to be done in it. Usually, at this point, if we're not rushing about starting the week, I plop down on the living room sofa. While plopped, I reach around and make stacks of whatever I can reach without moving too much. It usually takes until mid-day Sunday to be back to normal. 2. I have a theory about "good messes" and "bad messes". generated from socializing, sharing a meal, doing good work. next person will notice the problem and take care of it. To me, an adult who doesn't replace the toilet paper when it empties, or a parent who leaves a stinky diaper for the other parent to "discover" on a child, qualify as Bad Messes. 3. I don't want to sound Pollyannaish, (might just be unavoidable) but I tend to think of the dishes after Shabbat as part of the whole mitzvah of hospitality. It's not the work that's left over after the mitzvah; it's part and parcel of the whole package. I get MITZVAH credit (in my own mind, at least) for setting the table for guests, so I get credit also for clearing the table. 4. We also live in a busy community, so I'm partially motivated by the thought that it is very likely that people will be stopping by (to drop things off, pick things up, have a cup of tea, etc.) as soon as Shabbat is over. Somehow, the threat of being visited always motivates me to straighten up a bit more quickly. One thing I've noticed about some of the Flylady testimonials (certainly only some) is that the people in the testimonials tend to beat themselves up more than the average person about inevitable messes. If eating makes dirty dishes, then dirty dishes are to be expected, and are NOT (in my opinion) something to feel guilty about. If guests ate and there is a stack of three dozen dishes, then the stack isn't something to feel guilty about, but rather pride and gratitude. Pride, as in "I just fed umpteen people, they enjoyed it, and here's the evidence to prove it!" (NOT that this is a badge of honor to keep on display more than a day, but that if it's there just after Shabbat, it's a sign that you DID something, not that you haven't done it yet.) 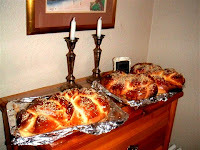 Gratitude, as in, "hey, we had enough (time, food, energy, freedom) to celebrate shabbat and even enough to share!" I hope that this tirade of mine doesn't come off as preachy. It is meant to be permission to take longer, to tiptoe around the kitchen and leave it without finishing everything, and to have you congratulate yourself for making it through a busy and meaningful shabbat. The dishes will wait. They'll even be back next week . Even more important, you'll do it all again next week, knowing that the pile of dishes are the result! And that's even more to your credit! I love your post. Many people have rules in their head that they've developed somewhere- (maybe from watching others, I'm not sure) for example, "Never go to bed with a sink full of dirty dishes". With Shabbos ending sometimes at 10 PM, who said the best thing to do is stay up all night cleaning the house after Shabbos? Important tip you gave about making sure the dishwasher is empty erev Shabbos, very very important. And you do what you can. Not what someone else can, what you can.